A quick online search for natural face masks for oily skin and blackheads will pull up dozens of trendy tricks, hacks, and DIY recipes for skincare masks; the problem is, few of them work. Most of these tips are based on misinformation, and will actually make your blackheads worse; some could even damage your skin. The lists below will let you know which at-home remedies are good, bad, and benign—but your best bet is to stick with research-based, scientifically proven methods for balancing oil and clearing blackheads. You’ll save time, money, and stress by steering clear of these worst-case blackhead scenarios, and focusing on products proven to work. Blackheads cannot be scrubbed (or squeezed) away. Blackheads are too deep in the pore to be completely squeezed out or removed by surface scrubbing. Worse yet, abrasive scrubs (even if they’re natural) can cause tiny tears in your skin, which over time stretch pores and increase the visible signs of aging. You can’t pull blackheads from your pores. Pore strips—whether store-bought or homemade—may extract a small portion of a blackhead, but they can’t get all of it. What they will do is irritate your skin, which increases oil production—and more oil means more blackheads. Keep your toothpaste in your mouth. Toothpaste ingredients do have a drying effect, which prompts some people to decide it’s a great product for shrinking blemishes or decreasing oiliness—but the dry skin, redness, and peeling that’ll follow are signs of skin damage, not clearer pores. Don’t cover your face with tape or glue—even if you’re dying of curiosity. Office supplies aren’t for skincare. Homemade face masks for blackheads and pimples shouldn’t hurt, turn your face red, or remove living skin from your face. Again, those are signs of skin damage, not care. Essential oils and countless “you’ve already got them in your pantry” natural ingredients won’t remove or prevent blackheads. Ignore all blackhead-clearing recommendations that suggest any type of mint or menthol, any type of citrus, rubbing alcohol, vinegar, cinnamon, or tea tree oil. Strawberries, salt water, and steam are also useless (and potentially damaging to skin). There isn’t a shred of research showing that any of these can eliminate blackheads. Simply put, there isn’t a DIY recipe for eliminating blackheads that can deliver the same results as key skincare products. 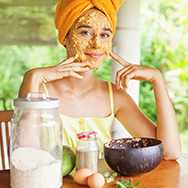 Not every homemade oil-reducing mask or at-home blackhead remedy will damage your skin. You’ll often see fenugreek, tomato, activated charcoal, clay, milk, castor oil, jojoba oil, flour, Epsom salts, egg whites, and gelatin recommended in natural face masks for acne and blackheads. These natural ingredients aren’t harmful; in fact, some have benefits that will temporarily make your skin feel less oily. But, while they’re harmless, none of these ingredients has the ability to remove blackheads or unclog pores. Other recommendations, like “cleanse your skin” or “splash your face with water” are also benign, if absurd in their simplicity. (If only it were that easy!) The one helpful piece of advice along these lines is to never use bar soap on your face; instead, find a water-soluble, fragrance-free, soap-free cleanser. Last, but not least, are the home remedies for pimples and blackheads that actually do provide substantial skin benefits. Turmeric, green tea, coconut oil, and oatmeal have potent antioxidant, anti-aging, skin-soothing, and/or emollient properties—but none of them can rid your face of blackheads. And coconut oil, because of its saturated fat content, could worsen blackheads if it gets stuck in the pore lining—which can easily happen. Do Any At-Home Blackhead Remedies Work? An aspirin mask is the most likely to work, though we still don’t recommend it. Most recipes combine dissolved aspirin and honey, which has benefits for skin. But the active ingredient is aspirin’s acetylsalicylic acid—a different form of the same ingredient in beta hydroxy acid (BHA, also known as salicylic acid) leave-on exfoliants. Salicylic acid does have the ability to clear pores and exfoliate dead skin. A purposefully formulated skincare product, however, will contain skin-restoring, nourishing, and hydrating ingredients, and will have the proper pH for optimal results—benefits you won’t get from dissolving aspirin in water. What Skincare Products Will Actually Get Rid of Blackheads? The short answer: No mask for pimples and blackheads will be as effective as daily use of a leave-on exfoliant with beta hydroxy acid (BHA). BHA balances oil, removes the dead skin that traps oil and dirt inside your pores, and visibly minimizes pore size. This quiz will help you find the right product for your skin type and concerns. And, if adding a daily leave-on exfoliant isn’t quite enough to clear your stubborn clogs and breakouts, consider a well-formulated benzoyl peroxide product as a preventive measure. Finally, check out our article Bye Bye Blackheads for more about how to prevent and clear clogged pores.